Recognizing the military service of men and women from Arenzville, Illinois. The attached photo was found in the effects of Rena Peters Geiss and her mother, Minnie Baujan Geiss. It was found this September in a trunk of saved family history. Minnie's sister Emma was wife of Herman Lippert and mother of several Lipperts of Concord. 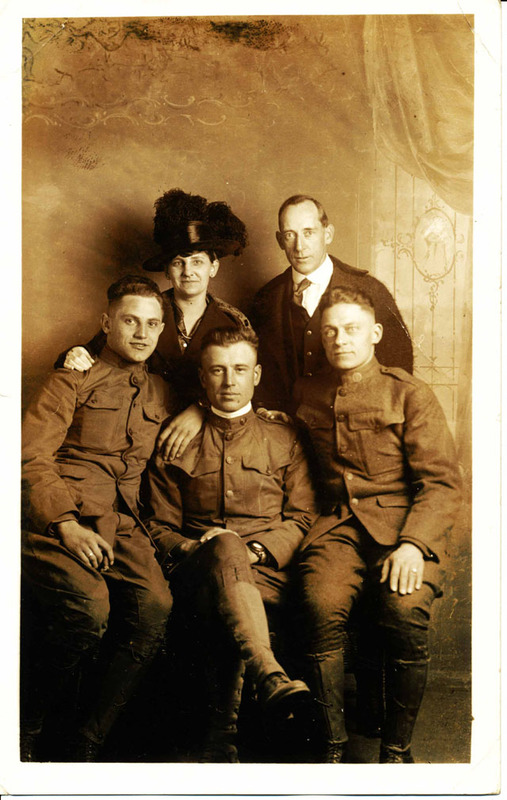 The persons in the photo are Emma and Herman Lippert, parents, and in front of them from left to right are William, Harry and Roy, their sons. All three of them served in WW I. The family has another photo of Roy wearing a medical core patch. He is not wearing it in this photo, which might indicate it was taken early in the time of service. He also appears in the 1920 census as a patient in the Fort Sheridan (Chicago) hospital. Later he married girl from Texas, settled in Plainview, and they operated a business school there with Court Reporting being one of their offerings. The brothers and approximate birth years are: Clarence 1890; Roy, 1891; Harry, 1896; and William (Willie), 1898. Harry and William’s names are inscribed on the veterans’ monument in Arenzville as having served during WW I. Thanks to Bob Miller of Tulsa, OK (native of Jacksonville and Meredosia) for providing the photo (for more information, email him at rgm@baujan.net). Copyright 2005, Molly Daniel. This page last updated 02/16/2009 .